I am breathing the hot, humid air of the Gulf Coast. It grips me in its damp embrace, like a wet kiss from a thousand jungles, a thousand streams, and a thousand swamps. It hangs heavy, physical, and palpable. I must work to fend it off with air-conditioning and cold drinks, yet it returns with a persistence born of eons of knowing that it will eventually win. This air spawns moss on the powerlines, mold on the paintwork, and destroys civilizations turning even great pyramids into simple mounds of earth. I left DF this morning to head northeast to Mérida. Yes, northeast. Sure, I have to go a bit farther south first, but once I turn north again in the Yucatán, Mexico City will be to my south. Mexico City doesn’t like being south of Mérida. Mexico City likes to think of itself as somehow not tropical, but industrious and forward-moving. This is not an attribute associated with southern Mexico, a place of banana and coffee plantations, dirt-poor campesinos, beach resorts, and rural backwaters hidden deep in valleys inaccessible to the autopistas that unite the rest of the country. Mérida is the odd man out in Southern Mexico, urban, reasonably prosperous, and educated. The rest of it is like another country compared to DF and the central highlands. My few days in DF were bittersweet. For me, the city is full of memories, and some ghosts, both real and allegorical. I’m sure F’s late sister’s spirit still haunts the city, not just on Dia de los Muertos. As I first drove to Puebla, I bypassed DF, and literally shed a few tears thinking that this wonderful city was no longer my main destination in Mexico. Once I returned, to see Steve and Bill, it was kind of like coming home. Since 2005, I’ve probably spent about 25 days a year there, and it really does feel like a second home. Everywhere I go, I think of the time F and I were there. I think of the book fairs, the dinners at restaurants, the beers we drank on shady patios, the museums we experienced together, and the plazas we walked. It is so strange to be there without him. Yet I am totally comfortable getting around the Zona Rosa, Roma, Condesa, and other places. The metro feels as familiar as Boston’s to me. I’m at home, but I’m not. My original plan was to stay Thursday night and Friday night, then leave Saturday. But I think of John Calypso’s advice about traveling on Sunday (“Even the bad guys take Sunday off, amigo” I hear him say in my mind). And it occurs to me too that everyone who can leave DF for Semana Santa is doing so on Saturday. So I decide to stay another night. And this also works out as my friend, Julio, couldn’t do dinner on Friday so we agree to meet Saturday night. Dinner is lovely, and I head back to my hotel to prepare to leave. My trip was relatively uneventful. Leaving on Sunday was very smart, as DF is actually relatively calm on Sundays, and I’m able to get to the Viaducto easily enough. Zaragoza is clear sailing, and before I know it, I’m on the autopista to Puebla. Something has happened to my truck, and it is running better than I would have ever thought possible. 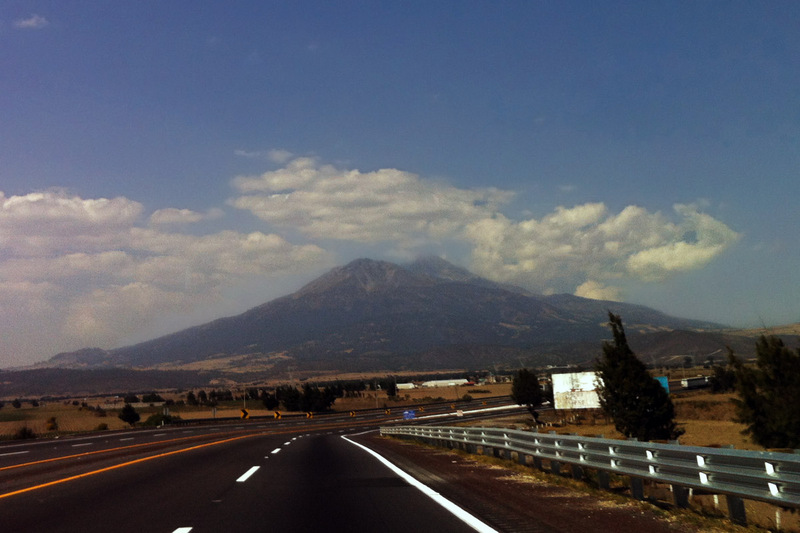 I’m also getting over my fear of driving in Mexico, so we sail over the mountains to Puebla with aplomb, pedal to the metal when necessary. 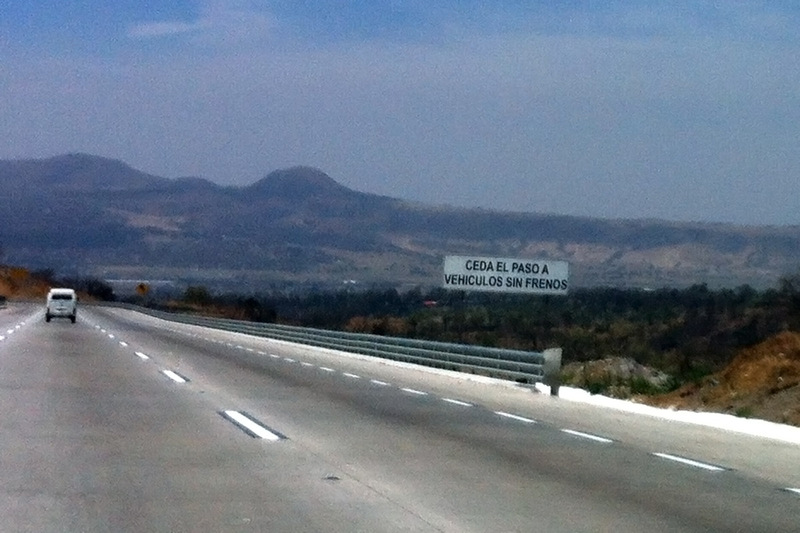 As I cross the Puebla/Veracruz state line, the terrain becomes incredibly mountainous, the road curvy, and tunnels begin to abound. I pass alarming signs that warn me to yield to vehicles without brakes. “Not only a good idea,” I think, “but the law.” I see semis with smoke pouring out of their brakes, and I keep a sharp eye on the rear view mirror. I wonder how fast a fully-loaded semi would go without brakes, down this steep, twisty freeway. I imagine the scene in my mind’s eye. A hurtling, swaying semi, horn furiously honking as it storms down the fast lane, the driver desperately trying to maintain control. I wonder if the torpid drivers ahead will realize what’s happening and pull over, or stubbornly go to their doom as fifty thousand pounds of household products bound for a superstore push them into the afterlife. I pray I don’t witness this. Yield to Vehicles Without Brakes. Good Idea! As we continue to descend, the terrain begins to change. The desert with nopales and joshua trees begins to give way to greener scenery with grass, and pine trees. Further down, fig trees start to appear. Tall, elegant white birds grace the streams and ponds, and an occasional one flies regally over the highway. Cows begin to appear on grassy farms along the road. Finally, I’m near sea level, and I begin to cross swamps and rivers. 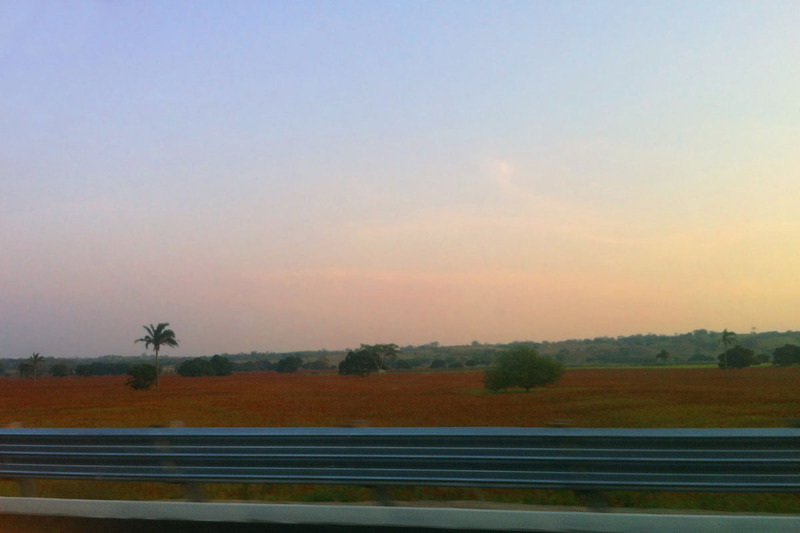 I’ve never seen this part of Mexico, and it’s nicer than I had expected, though there is a lot of it. Hours and hours of it in fact. As the sun begins to set, I wonder where I’m going to stay. At the final toll booth (thank god!) they tell me that Minatitlán is another hour. I figure I can make it before it gets too dark. And the highway is pretty well-traveled, so I’m less afraid of unseen dangers like animals, rocks, or worse. I finally arrive in Minatitlán. What a scary place at night! I’m on a huge boulevard, six or eight lanes wide. There’s a few dim street lamps in the center, but they shed very little light. At the side of the road are numerous combi stands, taxis, and comida corrida. But somehow the vibe isn’t good. Most of the storefronts are dark and seemingly abandoned. I keep driving, hoping that things will look better. I pull into an old “hot sheets” motel, the only place to stay I’ve seen so far, to check on rates. An old man in a grubby tank-top shows me the florid pink room, with lots of mirrors. I ask if there’s an ATM nearby as the cuotas have taken their toll (literally) on my cash. I explain that I’ll go get cash and perhaps be back. So I head down the road. As it turns out, about five miles later, there’s a Chedraui in a mall with a cinema, a food court, and tons of families shopping and hanging out. I’ve also passed a City Express Hotel, which becomes Choice #1 in my mind for my stay. I stop at the Chedraui. Someone tries to sell me a an acid-yellow sofa in the parking lot, but I beg off as being far from home. The seller nods knowingly. I buy a couple of supplies in the store, including a 187 ml bottle of red, Spanish wine which I figure will knock me out in my hotel room. Then I go to the food court, where I have my first experience trying to talk to Chinese people in Spanish. Though they seem to speak Spanish fine, their accent throws me, and we have a ridiculous discussion about moo shoo pork and the like, with me constantly asking them to repeat what they just said. One of them whips out a Mexico-born daughter to speak to me in local-accented Spanish, and I’m instantly reminded of similar situations in San Francisco. I eat in the food court. Unlike in Mexico City, here I am the whitest thing around BY FAR. In fact, lots of people look at me, not impolitely, but you can tell that very few Gringos come here. After I eat, I check into the City Express Hotel. The rate is reasonable. The room is clean, and it has an airconditioner that lets me fantasize that I am back in Boston. I write my post. Next job up? Collapse onto the bed. Tomorrow I hope to make it to at least Campeche, Campeche about 600 KM from here. According to the last road sign I passed, Mérida is about 1,000 KM. Looks like I’m finally going to make it. I am so proud of you. What an amazing drive. Thanks, Christine! I’m kind of amazed myself, really. Saludos. When Jean Metcalfe and I went to tour the ruinas de Palenque 20 years ago, we spent a few days adjusting to the climate in Villahermosa. It was the first time I’d been in such a crowded city with so many indigenous people. We were SO white and blue eyed, and (at 6′ 2″) I was at least 15 inches taller than the average person on the street. Jean complained that she needed to walk in front of me because everyone was stopping and staring up at my white face, then turning to watch me walk away – and they’d run right into her. Then they’d be startled to see her, “la abuelita guera”, and bubble over with apologies. She was afraid she wouldn’t be able to keep up with me. It was the strangest feeling I’ve ever had. It happened again when I was in Lima, Peru – but the streets were wider and the crowds were immense (but really short). Like swimming on a vast sea of bobbing heads, the near ones staring at you like you’re a freak. I drove through there, but did not stop to see it, though from the highway it didn’t look appealing. As for being the object of attention, I kind of enjoy it. Saludos y abrazos and thanks for commenting. Kim, loving your pickup truck odyssey through Mexico. I’ve made many trips to Yucatan but always tried for the coolest month like January. Still got clobbered by heat but at least not humidity. We always went out early then chilled for a long siesta emerging late afternoon for happy hour on the beach. Looking forward to your colorful and introspective ramblings of your road trip. Hi Rick! I wish I had been able to go in January, but if you go to the “posts by category” drop-down on the left and select “ridiculous setbacks,” you’ll see why January was impossible. I’m in Champotón, Campeche, a couple of hundred km from Mérida, and so far neither the heat nor the humidity are too bad. Saludos and thanks for commenting! Lordy, I sincerely hope you NEVER sleep in the back of your truck on your sleeping bag. I’ll have a heart attack. I’m glad you’re out in wide open spaces and heading east. Hopefully you make it to the ocean while down that way. The Bay of Campeche is so rich with deep deposits of oil and gas, the US and other countries are salivating at getting their hands on it in the near future! Hi Barbara, I grew up camping, so the idea of sleeping in the truck didn’t seem all that ridiculous initially, though I never planned to do so in Mexico. But now that I’m on the road, sleeping in the truck strikes me as insane — something best left to emergency situations. I’m in Champotón, Campeche, a little dot on the map right next to the carribbean. The sunset was amazing, and I’m about to eat some gulf shrimp. Life is good and I am thankful. Saludos. A Shrimp Cocktail in one of the little stands along the beach in Champoton! Delicious! Croft: By the time I got here, I was so hungry that I skipped shrimp cocktail, and went straight to shrimp dinner. I’m staying at a new hotel called “Lua Hotel,” which is nice, and has fully-functioning WiFi, which I appreciate in this backwater. Sorry it took me a while to respond to your earlier comment. I must have somehow missed it this AM. Thanks again for all your help. Hola John! Did you get my e-mail? Are you in Xico or still Pte Escondido? I hope to see you on the return. Saludos and thanks for commenting. P.S. I just figured out I spent $694 MXN in tolls yesterday, about $53 USD. Talk about ladrones!!! Especially given how crappy the road was. I do like tropical weather, if I’m near the ocean. But it is finally Spring here!! I am taking in the 80 degree sunny days. I did my big flower shopping and bought plenty of flowering bulbs to keep me busy gardening. I snuck a few exotic orchids in case the temperatures drop again, then I could pretend I’m in the tropics. Enjoy the heat – remember, it was not that long ago we were covered in snow and freezing. Hi Andean! I’m with you. I’m loving the hot weather, and every time I think I’m ready to complain, I just call up memories of shoveling snow with wet feet, and I’m again happy to be sweating. It’s better than shivering, any day! I hope your garden turns out fantastically! Saludos! It is raining cats and dogs here. Good for my newly planted bulbs. And the temps, they are cooperating, maintaining a Spring fashion. I’m good, on the Yucatán peninsula now. Saludos. Many years ago I spent a night in Minatitlán. (I was traveling with a Mexican friend and we spent the night at the home of his brother-in-law who was a doctor there.) It’s probably one of the last places in Mexico where I would want to live… oppressively hot and humid and dreadfully polluted. The air is so heavy with pollution from the oil industry that on occasion (according to the doctor) it actually rains oil. 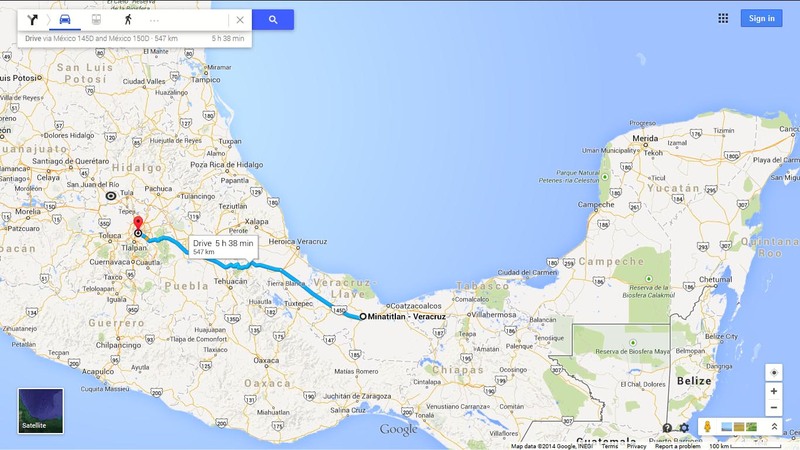 You should have no trouble reaching Campeche. Back in the day when I made my first journey from D.F. to Yucatán it was a terribly long ride since you had to take several ferry boats… bridges had not yet been built across all the rivers. One correction… I am 99% sure (and Alejandro agrees with me) that the mountain in the first picture is not Pico de Orizaba but La Malinche… Mexico’s 5th highest peak, located on the border of the states of Puebla and Tlaxcala. Safe travels, and enjoy the tropics! Hi Bill. I’m with you on Minatitlán. It doesn’t seem to have a lot to recommend it. As for the volcano, I’m not really sure either. But I did a quick bit of research after reading your comment, and La Malinche is close to Tlaxcala, which I didn’t pass by. Pico de Orizaba is approximately where I took the picture, according to some other maps I checked. That said, I could still be wrong, but I’m not yet convinced. Thanks for commenting. P.S. I took the photo on the outskirts of the town of Orizaba. It is Pico de Orizaba.https://maps.google.com/ . Sorry, it seems the link didn’t work. From where I took the picture, facing east, it seems likely to me that the mountain is Pico de Orizaba, especially since it was on the outskirts of Orizaba. Thanks for commenting and saludos. I stand corrected. There is no way that the mountain could be La Malinche given your location. And if you were facing northeast just before the highway curves into Esperanza, Puebla, then el Pico would be directly in front of you. It still doesn’t look like el Pico… but I’m used to seeing it with snow. Is this another result of global warming? Mexico’s peaks are losing their snow cover? Alejandro told me that he was able to see Popo the other day on the way to work, and it had no snow at all. By the way, the original and official name of el Pico de Orizaba is Citlaltepetl. Hi Bill, thanks for your persistence. The clouds at the top of the mountain also “cloud the issue” a bit too, LOL. Thanks for your comments and saludos! I am still chuckling over your Chinese-Spanish episode. It reminds me of the Korean restaurant you recommended. I struggled to comprehend the Korean waiter’s accent in Spanish until, all of a sudden, I could understand every word he said. He had switched to English. Have a great trip to the part of Mexico that is even steamier than Melaque — where I will be tomorrow morning. Steve: I’m pretty good at deciphering exotic accents in English, but it’s new to me in Spanish. Thanks for the comment and saludos! looking forward to your impressions of Merida. I’ve been enjoying your trip account. When we came down 8 years ago, it was quite different, we were such rubes, very little Spanish, but an intrepid spirit! we did stay in the ‘hoteles de paso’ and highly recommend them. Hi Debi. I’m looking forward to seeing all the changes in Mérida. The last time I was there was in 1993, which I think pre-dates the “Gringo Invasion,” so I’m pretty curious to see what’s changed. Saludos. Those hot-springs hotels (hoteles de paso) usually are quite nice. And peaceful and very inexpensive. It probably would have been a good option. But the City Express works too, of course. Felipe: F and I stayed in one near Irapuato. It was ok, though the room was filled with mosquitoes, and by the next morning we were well-bitten. But the love bugs left us alone. Saludos. Good post, I liked the conversation you had with you. It cracked me up. Great photos also. May you have following seas for the remainder of your adventure. I’m looking forward to your coming posts. Hey Francisco! One to three inches of snow!?! Good lord! I’m so glad I’m here. Thanks for commenting. Saludos. So you’re really coming to visit Mérida, are ya? I was just talking with friends about how the historic center has really picked up even in just the past two years. Vacant and dilapidated properties are finally getting fixed up and being put to use. You’ll be there at an interesting point in the city’s history, on the brink of something new. I’m looking forward to your impressions. Hi Lee! I’m looking forward to seeing all the changes. As noted above (below?) I was last in Mérida in 1993, and I’d imagine that it’s a different city now. And if it’s no hotter than here, I think I can take the heat. Of course it could get hotter. We’ll see. Saludos! What an adventure! I’m exhausted just reading it. Thanks for doing this and writing about it. ¡Buen viaje! Que te vaya muy bien. PS: years ago, we parked our pickup truck on the side of a secondary road near Ozoluama, Veracruz, and spent a very uncomfortable night sleeping on top of our cargo. The next night we found a comfortable, American style motel (not a a motel de paso) in Tampico. It was a very good move, as I became very ill at about midnight, and the nice bathroom was very convenient. Hola Don Cuevas! I have a sleeping bag and a pad, so I could theoretically sleep in the back of the truck, but so far I have never exercised that option. In this hot, sticky weather I think it would likely be dreadful. After getting through the mountains, I’m filled with renewed awe at Croft being able to pilot an RV on these roads. Saludos! Thanks, Simone! I hope you’re out eating cake somewhere. Saludos. What a journey! It has been such a pleasure reading your posts!!! Tonight’s post was accompanied by, and the perfect remedy to, an aching back and cup of tea! I can’t wait to see what’s next!!! Hi Jennifer! Thanks for the kind comment. I wondered if this post was too long, but as they say, if I had more time, it would have been shorter. Saludos! Yes, not much in Minatitlan. I am happy to see you decided to brave the perils of the 150D Cuota and head for the Yucatan! I am sure you can imagine what it is like in a 50 foot long combination of motorhome and tow car. One afternoon as we tired of the rough highway we pulled into Minatitlan with the motorhome looking for a place to park for the night. We drove into the back of the Chedraui and asked the guard if we could park there for the night. He was quick to grant permission. At about 3:00 AM we awoke to someone pounding on the side of the motorhome. I looked out and a security vehicle with flashing lights was parked there with the uniformed driver doing the pounding. He insisted we leave immediately. The guard who gave us permission was standing beside him so I pointed to him and said we had permission. The guard now looked at me like he had never seen me before or noticed the RV in his lot. I knew then that we had lost the battle. We moved and spent the rest of the night parked on the main street. Croft: I am AMAZED you’ve been able to drive an RV over the roads I’ve just traversed. You must have the patience of a saint. And I can’t tell you how many things I’ve dodged that I’d never be able to dodge in an RV. Kudos to you, and thanks for the warning about the road.